George Hand Wright was an American painter, illustrator and printmaker. Born in the Fox Chase section of Philadelphia, Pennsylvania, the son of a blacksmith, he attended the Spring Garden Institute, a local technical school, and was apprenticed to a lithographer. He studied at the Pennsylvania Academy of the Fine Arts under Robert Vonnoh, where his classmates included Robert Henri, John Sloan and William Glackens. He moved to New York City, and his first illustration appeared in Scribner's Magazine in 1893. He illustrated a number of books, and his work soon appeared regularly in magazines such as Scribner's, Harper's, Collier's, The Saturday Evening Post, and others. He married Anne Boylan, and in 1907 they settled in Westport, Connecticut. He became one of the founders of its artistic community. In mid-career, he turned from commercial illustration to watercolors, pastels and etchings. He exhibited at the Pennsylvania Academy of the Fine Arts, the Brooklyn Society of Etchers, the Society of American Etchers, and a number of New York galleries. He was a member of the Society of American Etchers, the Society of Illustrators, the Salmagundi Club and the Westport Artists. In 1939, he was elected to the National Academy of Design. Wright died in Westport in 1951. The Library of Congress has a collection of more than one hundred of his illustrations. A biography, George Hand Wright: An Artist's Life Examined by Kirsten M. Jensen, was published in 2008. 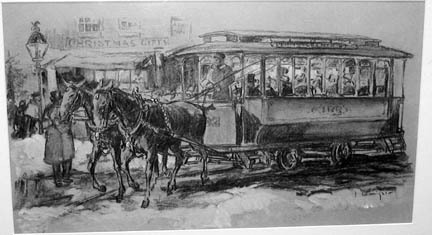 Wright, George Hand, “Horsedrawn Trolley,” Westport Public Schools Digital Collections, accessed April 24, 2019, https://collections.westportps.org/items/show/594.